There are normally five main areas that you need to check if your Z88 does not work. If the Z88 does not power up at all go to Dismantling your Z88, but check the text below if it is sort of working before you get your screwdriver out. Make sure that you follow the Inserting RAM or ROM Cards Rules as the Z88 gets confused on what size of memory it has if this has not been followed. Memory cards sometimes do go faulty. If they do, you do not need to dismantle the Z88 to fix them. You can add more memory (RAM packs) by following the INSERT RAM/ROM procedure, any time. Whenever removing a RAM you need to do a Soft Reset. This will clear the FAIL message and all your files that you may have stored. You can add programs (ROMs) by following the INSERT RAM/ROM procedure again any time. Turn the Z88 on and go into INDEX. You should try to leave Slot 3 free for EPROMs as they can ONLY be used there. You can use any of the Slots for RAMs or ROMs except if you put a RAM in slot 3, your Z88 will use more battery power. I have found that the following combination works best. Slot 1 RAM. Slot 2 RAM/ROM. Slot 3 EPROM only. See Check Z88 Cards. After inserting any card, it is a good idea to check that your Z88 knows about it by selecting (<>CARD) while in the INDEX. The display should match what you have really got in the card slots. If this does not match, you have found another problem. Sometimes the EPROM is not shown. See Header on EPROM. There are several sorts of memory failure. They all make the Z88 behave badly. There are two sorts of mechanical failure. The first sort gives you unexplained "Memory stack overflow" or FAIL messages at the top of the screen. The most common fault that causes this is when the RAM card physically comes apart. You will notice this when removing the card from the Z88. It may be a loose fit. What you should find is that the RAM card is made up of two halves and these are coming apart. Pressing the RAM pack together and wrap a strip clear sticky tape (one inch wide) around the outside the pack, near the connector. This should force the RAM pack together and will make better contact with the Z88 when plugged in again. Or using `SuperGlue' around the edge of the pack and squeezing it shut. Remember not to get your fingers stuck, as these are not required with the RAM pack. The second sort is that the Device just stops working due to the 'gold' contacts becoming dirty. The easiest way of doing this is by sliding the card in and out of the connector a few times. If this doesn't improve its performance use a very soft pencil rubber and clean both the connector in the Z88 and the 'gold' contacts. Be careful though, There is not a lot of 'gold' used on the connector, it is only 'mechanical gold' and you might find that you can clean it off altogether! The other type of failure is when part of the memory doesn't act like memory. This leads to inconsistent results when checking the size of the Ram with (<> CARD). For example, you may have a 512K Ram card in your Z88 but (<> CARD) reports that you only have 128K. See Check Z88 Cards. Running the BASIC program while `tapping' the RAM pack will find this sort of error. By downloading the following BBC Basic program, you can test 32K, 128K 512K and 1MB Ram packs. It is what is called a destructive Ram Test which means that all the data that is stored on the ram will be destroyed. So backup all your files before using it. See Backing up Files. Download the 4 files zipped, (original instructions, two .CLI files (which do the same thing) and the memory test software from here, and then transfer them to your Z88 with a transfer program. There are two ways you can use this program. Before using the program you should save the program to EPROM as "RAMTEST.BAS" and write the following BOOT.CLI to use with it. Take out the RAM pack. Put in the EPROM with the two files BOOT.CLI and RAMTEST.BAS in it. When you get the Command line "Size of card to test? (in KBytes, Eg. 32, 128 etc.)" type in the number of K the ram card is. Put the Ram card in Slot 1. Press the ENTER key until you get the "Testing . . . " message. The other sort of memory failure is where certain bits of memory suffer amnesia when you are not reading or writing to the memory. This is like when you are just storing files in the RAM. Run the program initially so that the checksums of the files are calculated. If you are using SqueeZ~88 or Zip, squeeze/Zip a load of big files. Turn off the Z88 and leave it alone for about three to five days. Re-run the program to see if the checksums of the files are different or unsqueeze/Unzip all the files again. If they are, then the RAM where the file was stored is faulty. Another sort of memory failure only occurs when you are booting the Z88 from slot 1 and it just fails to boot. This is caused by a card select fault, it is NOT the software. This failure may not be detected when OZ is running as OZ is managing which card it is selecting. When you boot from slot 1, OZ is not running the individual card's hardware needs to select the card. The normal conclusion is that you may have the fault with the card in slot 1, but this is not true, it could be any of them, you need to take all your other cards out and see if the fault persists. Unfortunately, all the other tests - Flashtest and the memory test will not detect this fault as they are running under OZ which hides the fault. If the display is cracked this is easy to replace but it is the most expensive item in the Z88. Symptoms are obvious. Cracked or broken glass, with oozing chemicals coming out of the display. Do not allow these chemicals to have contact with your skin. They cause cancer. The Z88 can work for a while before it becomes difficult to switch it On/Off with the Shift keys. Most problems like this are caused by the conductive rubber layer underneath the keyboard becoming removed. Keys like the cursor, delete and Shift keys, are the first to go. Clean the membrane with a soft pencil rubber where the keys make contact. Carefully clean the underside of the keys but make sure you don't remove any more of the conductive rubber coating that is used. Unfortunately we do not have any UK rubber keyboards or membranes left. You can fit a foreign keymat instead. You can get problems if the case becomes damaged internally, due to the Z88 being dropped. This can lead to short circuits occurring, rattling from inside the Z88. See Case Damage. There are two versions of the case. The UK and most of the European cases are just made out of black plastic. The USA version has the same plastic case from the outside but the inside is coated with a metallic finish. This improves the radio interference immunity so that the Z88 complies with the FCC regulations. Both have the same label on the back of the Z88 saying `Certified to comply with Class B limits Part 15 of FCC rules, ' so how can you tell the difference? If you look into an empty card slot (where the RAMs and EPROMs are fitted), you should see either a black or a silver inside. There are several parts that make up the complete case for the Z88. These are listed, with possible fault symptoms. The Display is the heaviest item in the Z88 and the least supported. Check that the four pillars that the display fits onto are still standing, with the rubber washers. Check the plastic battery lugs (the bit that supports the springs). They sometimes get broken resulting in the Z88 not working on batteries or worst still shorting out the power supply. The plastic lug behind the plastic leg often gets broken. The effect of this is that the leg always wants to flop down as there is nothing to hold it up when the leg is put away. This item can be replaced without dismantling your Z88. This also gives support to the display. Check that the four flat side supports for the display are still intact. You can often tell if they are not there by noticing a broken plastic ridge where it was. Normally, when the card flap is opened (with the Z88 turned on) the display goes out. This is because it operates a switch to let the operating system know that there are changes ahead. If the display does not go out, then the card flap or the support from the "Reaction plate" is broken and should be replaced. Although better RFI protection is achieved the metallic covering inside the case can lead to short circuits between the electronics and the case. This usually manifests itself after the Z88 has been reassembled. Underneath the printed circuit board there is normally an insulated mat. This can get punctured by IC pins on the board. The solution is to cut all those pins off close to the board. The other way shorts can occur is through the keyboard reaction plate. You should try to establish where the short is taking place, (easier said than done) and scrape the offending metallic part off the plastic making sure that no metallic bits fall anywhere near the electronics. Shorts can also occur while you are plugging in the Mains Adapter. These fall off and can be easily replaced. Do not use SUPERGLUE on the front feet. You might need to get to the screws underneath them. To change any of these parts yourself see Dismantling Your Z88. This is not an area for the weak hearted Z88 user. If the Z88 appears to work and then does unexplained things, the printed circuit board may be faulty. Usually if they go wrong they show themselves within the year's guaranty period. You can also check Power Consumption as this can reveal some electronics faults. You can check the power consumption of your Z88. This can show up problems with either the keyboard or electronics. An ammeter which can measure up to 300 mA. A double sided blank printed circuit board. Cut the printed circuit board so that it will fit between the batteries in the Z88. Solder two bits of wire on each side of the printed circuit board. Fasten the crocodile clips to the other end of the wires. Connect the crocodile clips to the probes of the ammeter. Place the printed circuit board between two batteries that you can get to (with the cover off). Check that the ammeter is measuring some current. If it isn't then you need to check why not quickly, since your Z88 will be starved of power and will die. Now you can do different things with your Z88, like turning it ON and take notes of the different readings. See Power Consumption Table to compare your results. If you are a person that experiences electric shocks when grabbing metalling objects you need to take several precautions when plugging the mains adapter in or Dismantling Your Z88. To get rid of static electricity, the object is to get all the parts that you are working with to the same voltage. This is normally done in the household by using the earth pin. As more items are made of plastic, you never get the chance to return to earth during the day. Here are a few tips that may help you. If you are Dismantling Your Z88 you should EARTH yourself and then the Z88 (by touching the metal part around the RS-232 serial port) before you start any work. Both feet in a bucket of salty water connected to the radiator may be going a bit too far. Remove all insulating materials like nylon and rubber soles. When Cambridge Computer manufactured the Z88, they wrote some 'Quality Assurance' software to test the Z88. If you want your Z88 to be tested, you can send it to me and I will test it using the following test for �5 + the return carriage. Alternatively you can do this yourself using the program and the hardware required as given below. This is the 128K EPROM Test Program Pack they used. To use this software you download the 3 files and save them to an EPROM pack. You must not use a Flash EPROM because the test involves blowing a bit into the EPROM pack which is incompatible with the Flash EPROM. The program should automatically start. If you see 'Tester Software not compatible' it is because you are not running version 2.2. Delete Line 10 by typing '10 ENTER' and 'RUN' the program again. This checks that all your keys are recognised. Just press them in the correct order. It should just go beeb beeb beeb. This test the serial port. Use a 9 way plug with the 3 loop back connections. I have just used 3 bits of wire (or paperclips) and poked them in the socket on the Z88. There were no large RAM made when this test was written, so they used a 32K RAM card, linking the extra address lines. You are supposed to wiggle a mains adapter plug into the Z88. A better test is to do this without any batteries in the Z88. Just press the SPACE BAR. Turn the contrast right up one way and then the other. You should get a completely black screen and a white screen the other way. Blows a bit into your EPROM pack. If you do this a lot, it will fill it up and you will then need to erase and resave your files again. At the end of the tests you will see a report with PASSED PASSED or FAIL for each of the tests depending on whether you pressed the SPACE BAR or any other key. Your Z88 comes with a year's guarantee. This is invalidated once you open the Z88. You should, if your Z88 is within the warranty period get in touch with your Z88 dealer before dismantling it. If your Z88 is outside the guarantee period or its origin is questionable, then here is your chance to see what is inside. Back-up your Z88. See Backing up Files. Read the Static Electricity Section. You do not need to take the Z88 all to pieces to replace certain items. These points will be highlighted with what you can do there. Otherwise, just continue. You should take care with the display unit as this is fragile and will move about after the screws have been removed. 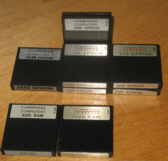 Remove any RAMs, ROMs or EPROMs from the card slots. Place the Z88 face down on a soft cloth larger than the Z88 like a towel. Remove the two square front rubber feet. This should reveal two screws. The keyboard may be checked first by removing the FIVE screws below it. Remove the keyboard, by carefully hinging it upwards from the rubber feet end. Part of the keyboard is under the top case but it can be slid out carefully. Disconnect the two flat plastic connectors by pulling them out from the main board. The Z88 can be tested again at this point by inserting the batteries and giving the Z88 a Hard Reset to see if it boots up. If it does, you have a keyboard fault. Move the Serial No. label under the plastic leg to a different place. This will reveal another screw. You should now see the remaining SIX of the ELEVEN screws. Undo them all and keep them in a safe place. They are all the same type. Get hold of the Z88 by the top and bottom case, roughly level with the power socket hole and the Serial Port socket and turn it over, gripping hard to keep it together. Remember, you have just taken out the screws. There is nothing holding it together now. Carefully remove the top case where the display is. Disconnect the display unit from the main board. Remove the display unit. NOTE PUT THIS IN A SAFE PLACE. IT IS FRAGILE AND THE MOST EXPENSIVE PART TO REPLACE. Take the Serial Port connector out of the plastic moulding. Carefully remove the main board from the bottom case. You should now have the Z88 all in bits. This is the reverse of the above with the following points. Now that everything is out, why not clean the inside of the case, the display unit and the keyboard. If you have taken the batteries out, put them back in after the Z88 has been assembled. When replacing the keyboard, take care not to bend the membrane connectors. Lay them on the resistors and push them up into the connector with your finger. Check that the Z88 works (with the Mains Adapter if the batteries have been removed) before putting in the ELEVEN screws. That will save you taking them all out again if it doesn't work. Check that the leg from the Reaction Plate is holding the Card Flap correctly. Make sure that the wires to the battery clips do not get trapped between the top case and keyboard. Use the same thread in the plastic case that was created before by just using the weight of the screwdriver on the screw whilst turning it anti-clockwise. When the screw drops into the start of the thread, you can then tighten it up. Do NOT do the screws up too tightly. It is easy to damage the thread in the plastic. Do not move the Serial No. label back over the screw hole. Leave it where you moved it to. The keyboard is one of the most common causes for problems. There are three parts of this assembly. Clean the existing Reaction Plate. Make sure that you have the three parts the right way round. There is only one way that make's sense. Push the three rubber grommets through the membrane and the reaction plate. A small screwdriver or a pair of tweezers will help here. Push the keyboard mat around the outside of the reaction plate. Use SuperGlue or strong adhesive tape to stick the keyboard mat to the reaction plate along the front edge. Wait until the glue has set before installing the keyboard to the Z88.